YiChao is a high technology medical beauty equipment supplier. Most of our equipments are TOP technology of global. There is no second supplier or customers can find the same equipments that we invented in China even all over the world! If you cooperate with us ,You can have a lot of loyal customers because they can not enjoy the same treatment and services elsewhere. You can quickly return the cost of purchasing the instruments. Our equipments can create huge economic benefits for you. Our three-year warranty on equipments set your mind at rest. YCBH-01 is a professional Shr+Elight+IPL equipment for hair removal, skin rejuvenation, skin whitening, freckle removal and pigmentation. The use of three-dimensional technology concepts: energy+pulse width + pulse waveform. OPT/IPL Uses low and equal energy with new AFT technology (Advanced Fluorescence Technology). OPT/IPL uses the cutting-edge intense pulsed light technology, belongs to the fourth generation of photonic technology,perfect OPT (Optimal Pulse Technology) core technology, the use of three-dimensional technology concepts: energy + Pulse Width + pulse waveform. 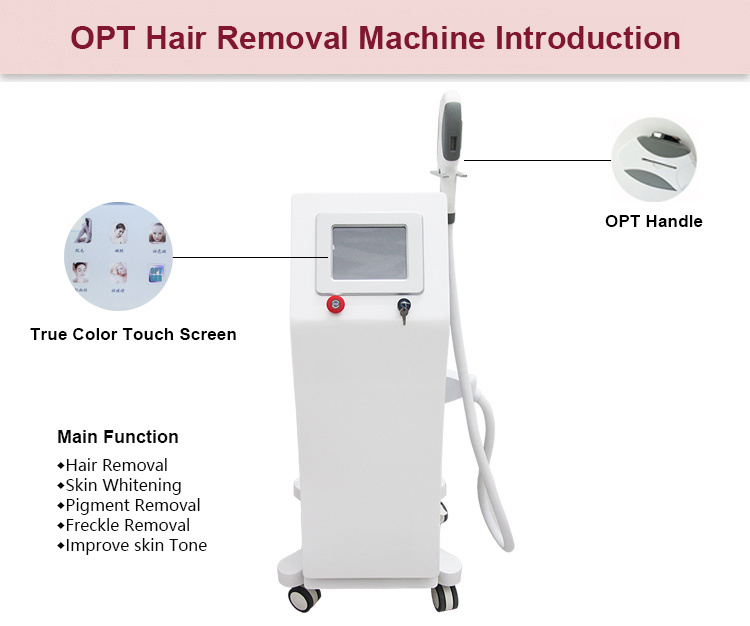 Due to changes the pattern of treatment light output, OPT/IPL is a revolutionary in the development, not only improve the efficiency greatly but also safety. 480nm: Removing the pigment skin pathological changes, the pigmentation caused by color pigment mixture, Shrink large pore. 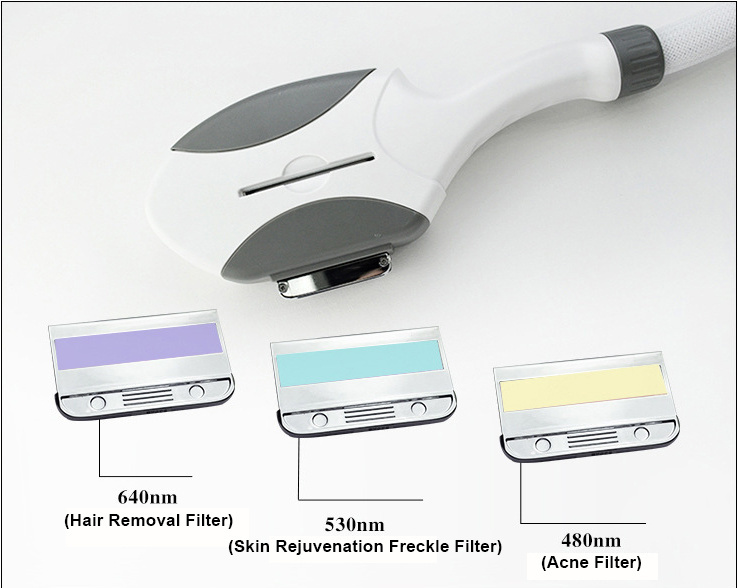 530nm: Acne therapy, All kinds of spots removal, freckle removal. 1). Rejuvenation: Improve the forehead, face, arms, abdomen, legs and other skin roughness, shrink pores, increase skin elasticity, delicate white. 2). Lift: eye bags, dark circles treatment. Get rid of crow's feet, neck lines, wrinkles and fine lines less shallow, improve skin tension and restore tightening the skin, restore elasticity tender, adjust dumb complexion. 4). Freckle: freckles, chloasma, sunburn, age spots, liver spots, dermal spot, birthmark and some pigmentation. 5). 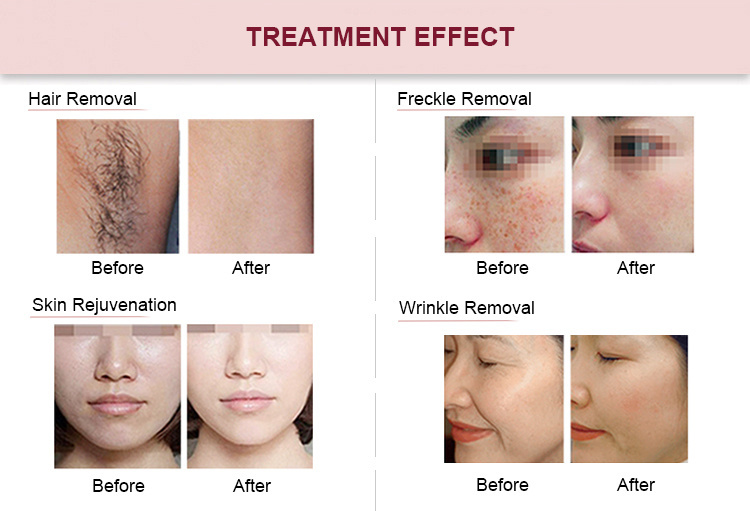 Wrinkle: get rid of Sichuan word lines, nasolabial wrinkle, face, forehead, neck, waist, hips, legs and other wrinkles. 6). Acne: face, shoulders, chest, waist, hips and other parts of bacterial infectious acne. 7). Eradicates acne: Results boil type acne, acne type of acne, allergic acne, acne scars, acne pits, rosacea. 8). Eradicates redness: congenital redness, skin redness, red face, redness, skin allergies and sensitive. 9). Improve skin texture: improving dry skin, oily, aging, texture, color and other integrated problem. 10). Tighten the plastic back, tighten the waist shaping, leg type. 1). SHR&E-light two tecnology in one machine more advanced,SHR handle can rapidly remove hair also permanent hair removal. 2). 10 inch color touch screen easy to operate and the appearance looks like more beautiful. 3). Our xenon lamp is imported in UK, it can be shot about 300,000 shots. 4). The treatment only a slight burning sensation.Painless:new AFT technology (Advanced Fluorescence Technology) uses low and equal energy,which make patient feel no pain. 5). Non-invasive,no follow-up care,no side effects.Fast treatment.Frequency up to 10Hz! Skin is free,suitable for all skin types,even tanners. 6). This machine with many functions is worth buying,most of all,added the function of breast lift up. 7). We can help you adjust to your local languages and add LOGO on the machine screen and machine body. 8). SHR and E light system is a combination of high-tech optics medicine and human biological engineering technology, change the past, wrinkles and rejuvenation deep wrinkles, high safety factor, no pigmentation. 9). Many accessories and packag in Aluminum Alloy Box. 10). Power of the machine can reach 2500w, SHR spot size is 15*50mm. 11). The machine with 3 filters and the system is automatically recognize different filter according to its function,so don`t need to change filter. 12). Better cooling system:water cooling+semiconductor cooling+air cooling+screen cooling.